After Bible Study on Wednesday I went on over to Angela’s home thinking that we might swap child watching and get some errands done. Well, to make a short story shorter, Angela had this great idea to go to Safeway together. With our children. “Sure, that sounds fun!” I said, and I actually meant it then. Wow. It was crazy. Apparently our children do reasonably well while shopping with mama and syblings, but add friends into the picture and all of a sudden the store is one big playground. Through all that Angela and I did our best to contain them, but I must admit we weren’t trying too hard as we were somewhat mesmerized by the bright, orange stickers everywhere. As you can see, almost everything I bought had a clearance sticker on it, and most of them had multiples. Angela’s cart looked the same, loaded with stickers. 3 Activia Yogurt 4pcks $2.50 each – $6.75 in stickers – 3 $1 coupons = $2.25MoneyMaker! Considering I bought 3 packs of meat and 1 jar of overpriced peanut butter, (and yes, I am a peanut butter snob) that would have totalled well over $20 in these things alone, I think my crazy shopping trip went well. Anon: The stickers are clearance stickers on items that are nearing the "sell by" date and the store wants to clear them out. Each sticker represents a certain $ off. The more stickers, the bigger the discount. When you check out, the cashier just deducts the amount of the stickers from the item. We often combine the clearance savings with a coupon & a Safeway double, which usually makes the item free or a moneymaker. The more traffic a store has, the less likely chance clearance stickers will appear. I live near a slower store, so we often have stickers. I just started shopping at safeway for some of their deals and have never seen these orange stickers. What does it mean when you have several orange stickers on an item? How does it work? Thanks for all your hard work! I went to Safeway last night and the glow of the orange stickers was sparce. Anyway, I got a great deal, but my cashier majorly screwed up and I didn’t realize it till I got home. I got the 18ct. carton of eggs that was supposed to be $.97 and the eggs didn’t scan in but he also scanned the coupon that did scan in for some reason. The coupon took off $2.52. So I had a total of $3.49 that I should’ve paid but didn’t. I might have to go back and confess. I didn’t realize the mistake till I got home, but I did know that the price sounded low. I made a bunch of money last week on the yogurts + stickers + coupons + doubles. 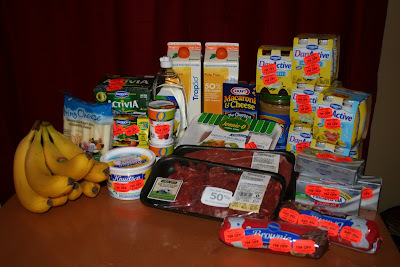 I think after a few Safeway trips I had “bought” about $30 worth of stuff for a total of $1!! All we’ve been eating since then is yogurt! lol!